(Nanowerk Spotlight) Nano-this and nano-that. These days it seems you need the prefix “nano” for products or applications if you want to be either very trendy or incredibly scary. This “nanotrend” has assumed “mega” proportions: Patent offices around the world are swamped with nanotechnology-related applications; investment advisors compile nanotechnology stock indices and predict a coming boom in nanotechnology stocks with misleading estimates floating around of a trillion-dollar industry within 10 years; pundits promise a new world with radically different medical procedures, manufacturing technologies and solutions to environmental problems; nano conferences and trade shows are thriving all over the world; scientific journals are awash in articles dealing with nanoscience discoveries and nano technologies breakthroughs. Nanotechnology has been plagued by a lot of hype, but cynicism and criticism have not been far behind. Science fiction writers exploit fears of nanorobots turning into killers; the media can run amok when news about potential health problems with nanoproducts surface (as happened last year with a product recall for a bathroom cleaner in Germany). Some see doomsday scenarios of molecular self-assembly turning the world into "grey goo". The emerging polarization of opinions on nanotechnology is reminiscent of controversies about genetically modified plants or nuclear energy. Vague promises of a better life are met by equally vague, generalized fears about a worse future. These debates have some aspects in common: the subject is complex and not easy to explain; there is no consensus on risks and benefits; scientists and corporations seem able to proceed unchecked, and it is unclear who is in control. Often the problem of emerging, deeply transformative technologies is that they lack a "social constitution" that addresses questions like: Where can I get information I can trust? On what terms is the technology introduced? What risks apply, with what certainty and to whom? Who benefits? Who takes responsibility for problems? A particular problem with nanotechnology lies in the huge gap between the public perception of what the hype promises and the scientific and commercial reality of what the technology actually delivers today and in the near future. What’s so special about nanotechnology and why is it an issue now? Chemists have dealt with naturally occurring nanoparticles all along. Think molecules or viruses. Toxicologists have dealt with nanoparticles that are the result of modern human life such as carbon particles in combustion engine exhaust. Without being aware of it, tire manufacturers used nanoparticles nanotechnology – carbon black – to improve the performance of tires as early as the 1920s. Medieval artists used gold nanoparticles to achieve the bright red color in church windows (gold particles in nanometer size are red, not golden). You might even say that we are surrounded by, and made of, nanostructures – atoms and molecules are nanoscale objects after all. So what is all the fuss about, and where do the risk issues come from all of a sudden? The ongoing quest for miniaturization has resulted in tools such as the atomic force microscope (AFM) and the scanning tunneling microscope (STM). Combined with refined processes such as electron beam lithography, these instruments allow us to deliberately manipulate and manufacture nanostructures. Engineered nanomaterials, either by way of a top-down approach (a bulk material is reduced in size to nanoscale pattern) or a bottom-up approach (larger structures are built or grown atom by atom or molecule by molecule), go beyond just a further step in miniaturization. They have broken a size barrier below which quantization of energy for the electrons in solids becomes relevant. The so-called “quantum size effect” describes the physics of electron properties in solids with great reductions in particle size. This effect does not come into play by going from macro to micro dimensions. However, it becomes dominant when the nanometer size range is reached. Materials reduced to the nanoscale can suddenly show very different properties compared to what they show on a macroscale. For instance, opaque substances become transparent (copper); inert materials become catalysts (platinum); stable materials turn combustible (aluminum); solids turn into liquids at room temperature (gold); insulators become conductors (silicon). A second important aspect of the nanoscale is that the smaller a nanoparticle gets, the larger its relative surface area becomes. Its electronic structure changes dramatically, too. Both effects lead to greatly improved catalytic activity but can also lead to aggressive chemical reactivity. The fascination with nanotechnology stems from these unique quantum and surface phenomena that matter exhibits at the nano-scale, making possible novel applications and interesting materials. In order to discuss the risks of nanotechnology we need to take a closer look at these nanostructures. The mere presence of nanomaterials is not in itself a threat. It is only certain aspects that can make them risky, in particular their mobility and their increased reactivity. Only if certain properties of certain nanoparticles were proven harmful to living beings or the environment would we be faced with a genuine hazard. In addressing the health and environmental impact of nanotechnology we need to differentiate two types of nanostructures: (1) Nanocomposites, nanostructured surfaces and nanocomponents (electronic, optical, sensors etc. ), where nanoscale particles are incorporated into a substance, material or device (“fixed” nano-particles); and (2) “free” nanoparticles, where at some stage in production or use individual nanoparticles of a substance are present. These free nanoparticles could be nanoscale species of elements, or simple compounds, but also complex compounds where for instance a nanoparticle of a particular element is coated with another substance (“coated” nanoparticle or “core-shell” nanoparticle). There are four entry routes for nanoparticles into the body: they can be inhaled, swallowed, absorbed through skin or be deliberately injected during medical procedures. Once within the body they are highly mobile and in some instances can even cross the blood-brain barrier. How these nanoparticles behave inside the organism is one of the big issues that need to be resolved. >Basically, the behavior of nanoparticles is a function of their size, shape and surface reactivity with the surrounding tissue. They could cause “overload” on phagocytes, cells that ingest and destroy foreign matter, thereby triggering stress reactions that lead to inflammation and weaken the body’s defense against other pathogens. Apart from what happens if non- or slowly degradable nanoparticles accumulate in organs, another concern is their potential interaction with biological processes inside the body: because of their large surface, nanoparticles on exposure to tissue and fluids will immediately absorb onto their surface some of the macromolecules they encounter. Can this, for instance, affect the regulatory mechanisms of enzymes and other proteins? Not enough data exists to know for sure if nanoparticles could have undesirable effects on the environment. Two areas are relevant here: (1) In free form nanoparticles can be released in the air or water during production (or production accidents) or as waste byproduct of production, and ultimately accumulate in the soil, water or plant life. 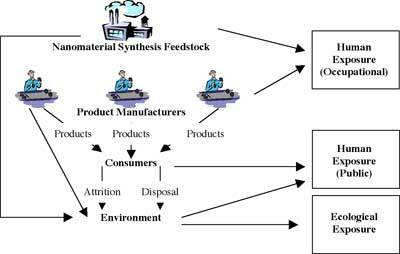 (2) In fixed form, where they are part of a manufactured substance or product, they will ultimately have to be recycled or disposed of as waste. We don’t know yet if certain nanoparticles will constitute a completely new class of non-biodegradable pollutant. In case they do, we also don’t know yet how such pollutants could be removed from air or water because most traditional filters are not suitable for such tasks (their pores are too big to catch nanoparticles). Health and environmental issues combine in the workplace of companies engaged in producing or using nanomaterials products and in the laboratories engaged in nanoscience and nanotechnology research. It is safe to say that current workplace exposure standards for dusts cannot be applied directly to nanoparticle dusts. To properly assess the health hazards of engineered nano-particles the whole life cycle of these particles needs to be evaluated, including their fabrication, storage and distribution, application and potential abuse, and disposal. The impact on humans or the environment may vary at different stages of the life cycle. Regulatory bodies such as the Environmental Protection Agency and the Food and Drug Administration in the U.S. or the Health & Consumer Protection Directorate of the European Commission have started dealing with the potential risks posed by nanoparticles. So far, neither engineered nanoparticles nor the products and materials that contain them are subject to any special regulation regarding production, handling or labeling. The Material Safety Data Sheets that must be issued for certain materials often do not differentiate between bulk and nanoscale size of the material in question. Looking at all available data, it must be concluded that current risk assessment methodologies are not suited to the hazards associated with nanoparticles; in particular, existing toxicological and eco-toxicological methods are not up to the task; exposure evaluation (dose) needs to be expressed as quantity of nanoparticles and/or surface area rather than simply mass; equipment for routine detecting and measuring nanoparticles in air, water or soil is inadequate; and very little is known about the physiological responses to nanoparticles. Regulatory bodies in the U.S. as well as in the EU have concluded that nanoparticles form the potential for an entirely new risk and that it is necessary to carry out an extensive analysis of the risk. The outcome of these studies can then form the basis for government und international regulations. In our era of global trade it is imperative that national and international regulatory bodies cooperate closely not only with each other, but also with academia and industry, in developing harmonized terminology and standards, a framework for health and environmental risk assessment and, based on that, the necessary regulations and guidelines so that nanomaterials and potential nanotechnological applications can be developed responsibly. With that in place we can look forward to optimizing the benefits of nanotechnology potential while minimizing and controlling the risks.